I wrote back on March 24th about a good experience with educational charity Donors Choose and mentioned that I was looking at possibly doing a contest for another proposal that had touched me. It was this one, for a teacher who is in a wheelchair and wanted a wheelchair-accessible overhead projector cart so that he or she could write on the ‘blackboard’ and the students would be able to see it. Well, I gave a small amount, and figured I’d dole out the rest periodically and maybe run the contest. However, my loving mother graciously funded the balance on it. So the teacher will get the cart, and will be able to function better in the classroom. A special-needs teacher in a special-needs classroom getting what they need to succeed? I’m feeling good about that. Thanks, Mom, you’re a wonderful person. Heh. I love adding rumors to the Dragonrealms rumor system. It feels so sneaky. Behold the power of Jayne! The power of the Jayne hat knows no bounds! It can inspire true love, it can bring a smile to everyone’s lips, it can even keep you warm in Antarctica. If only our world leaders would wear Jayne hats, our problems would be solved in no time! In other knitting news, my daughter actually asked me to knit something for her. She saw a shop model at Charlotte Yarn and liked it, so I picked up a skein of Southwest Trading Company “Phoenix” which is a 100% soy ribbon yarn. 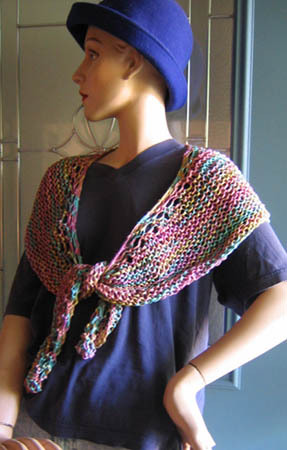 The colorway, appropriately, is “Candy.” The shop model was knit on 13s, but I did it on 11s with a 13 for the bindoff. Smaller needles = smaller stitches = smaller garment for my smaller girl. It’s straight garter stitch with a few yarn overs at the beginning of each row to add a few stitches. The yarn overs make the larger holes, and they also make it grow gently so that it’s got a more curved shape instead of being a rectangle. There was one knot in the skein, when I wouldn’t expect any in a skein of yarn that retails for $12.50. Because it’s for a seven-year-old who won’t care about details, I just knotted the ends and didn’t bother with anything fancy. 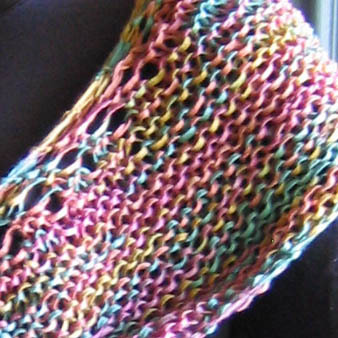 I also just did a regular bind-off, when a suspended bind-off would probably have been better for a looser edge. Eh, whatever, she’s very happy with it and doesn’t want to take it off. I saw The Life Aquatic with Steve Zissou a couple of days ago. Very enjoyable. Odd, but enjoyable. It seemed detached from itself sometimes, but at a key moment in the film, I was literally leaning forward in my seat to try to catch a better look. Not for everyone, I think, but still I recommend it. And the movie proves once again that Willem DaFoe is a fantastic actor. Back to the Jayne mines! Hat on the needles for Ohio, next up are Maryland, Florida, and Ohio again. In conjunction with the Can’t Stop the Serenity campaign, a big-screen theater in Raleigh, NC will be showing Serenity, with proceeds going to Equality Now, Joss Whedon’s charity of choice. I thought I wouldn’t be able to make it up there because the hubby was going to be out of town – ironically, out of town in Raleigh – but it looks like Thursday June 22nd will work after all. Yay! I wish this were going on Charlotte, but I don’t have the time to organize it. I’m happy it’s going on within a 4-hour drive, though! I need to be sure the timing will work out, because this could turn into an overnight trip if I don’t want to be on the road at 2 in the morning. This is going on in cities all over America, so if you’re a Serenity fan, check out the site and see if there’s somewhere near you that you can see it on the big screen. Jayne hats up next are Utah, Ohio, Maryland, and Florida. On an unrelated note, we discovered last night we discovered that while my daughter likes salt and pepper on her ice cream, she HATES parmesan cheese on her spaghetti. Live and learn. I raise my finger to you! mentioning that he’s going to get a tattoo made me think of moustache tattoos. No doubt this is one more thing that the young people today already knew all about, but I didn’t, and I sure thought it was funny. Stupid and permanent, but funny. Hell, no, I’m not buying a $650 rug that my cat would claw to ribbons anyway. But I gotta say, those zombies are very tempting. I only got 100 with my copy of Zombies!!! and you never know when you might need eight thousand and seventy six spares. Zombies!!! is a fun board game put out by a small company, and I enjoy it. If you prefer your zombie action online, though, there’s always The Urban Dead. 8am: Take daughter to dentist. Find out she’s got a cavity in a permanent molar, which didn’t come in that long ago. Dentist believes this means she has unusually weak enamel and will need to be very careful throughout her life. Discuss using nitrous oxide to put the whammy on my daughter while filling her cavity. I tell him I need to do more research first. 9am: Run over chipmunk while taking daughter to school. Lordy, I’m afraid to do anything else today. 11am: Say “screw it!” and go to Original Pancake House. 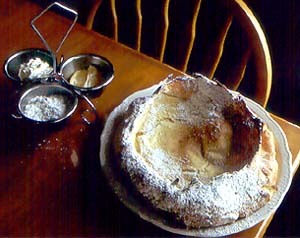 Order gigantic Dutch Baby filled with fresh strawberries, accompanied by bacon, skim milk, and fresh-squeezed orange juice. Eat half, take rest home to drown more sorrows in later. Behold the power of the airbrush. Click on ‘portfolio’ from the left side-bar. Show it to every teenage girl you can find. Well, *I* think it’s good news. I am now 944 dollars poorer. However, my car runs like a dream. This serves me right for not taking care of it sooner, and for not getting the dent pounded out when I got in a fender bender in December ’04. On certain turns that were angled just so, the left front tire would scrape against the wheel well, which didn’t exactly help the alignment. They had to pound out the dent some to work on the struts, with the result that now it doesn’t scrape anymore. My baby, she is purring like a kitten. These guys were fair with us, and I feel the price was fair. We’re going to look at getting the hubby’s air conditioning fixed. It’s been broken for years, and in the South in the summertime, that is not a car you want to take road trips in. Thank GOD for that tax refund.